In March 1957, as Elvis was buying Graceland and the Soviets were preparing to shock the world with Sputnik, Robert F. Wagner, the famously cautious mayor of New York, was having trouble taking a stand. In two days, the city’s Board of Estimate would hold a hearing on one of the most contentious issues of the Cold War: whether to begin fluoridation of New York’s drinking water, which the Board of Health had urged more than a year earlier to fight cavities. Critics had denounced it as forced medication, dangerously toxic or a Communist plot. Yet the mayor hesitated. He liked to give problems a chance to go away on their own. Fluoridation, at one part per million, one milligram per liter, would not come to New York until 1965, after another eight hard-fought years. Now, in this 50th anniversary year, a collection of papers being prepared for scholarly access in the archives of Baruch College’s Newman Library has opened a window onto one of history’s greatest public health debates. Even now, the issue continues to divide communities. Portland, Ore., voted down fluoridation in 2013 — for the fourth time — and Israel ended mandatory fluoridation last year. About three-quarters of Americans drink fluoridated water, but the federal Department of Health and Human Services is reviewing a new lower standard for added fluoride, perhaps reducing the recommended level to 0.7 milligrams per liter. Paul Connett, the group’s executive director, noted that studies by the Centers for Disease Control and Prevention have found that about 40 percent of teenagers now display dental fluorosis, or mottling on teeth caused by high fluoride levels. That percentage has doubled in less than 20 years. The C.D.C. denies any backtracking from support of fluoridation out of health concerns. “Not at all,” said Linda S. Orgain, a C.D.C. spokeswoman. She called the proposed decrease for added fluoride, first published in the Federal Register in 2011, “a response to differing conditions today” when children are getting fluoride from various sources, including toothpaste. The fluoridation files at Baruch document efforts to sway Wagner and other city officials. The records are part of a collection of the influential but now-defunct Institute of Public Administration and its longtime director, Luther Halsey Gulick, a key adviser to President Franklin D. Roosevelt and Wagner. The roots of the controversy go back to the early 20th century, when researchers noticed that teeth mottled by high levels of natural fluoride resisted cavities. Studies concluded that water fluoridated at one part per million safely reduced tooth decay in children by some 60 percent. By 1954, 20 million Americans were drinking fluoridated water in Baltimore, Washington, Miami, San Francisco and other major cities. The New York City health commissioner, Leona Baumgartner, recommended joining them, and the Board of Health gave its approval two years later. Out of a 1956 City Council hearing grew a powerful advocacy group, the Committee to Protect Our Children’s Teeth, led by the noted pediatrician Dr. Benjamin Spock. Members included Eleanor Roosevelt, Jackie Robinson, former Governor Herbert H. Lehman, the commentator H.V. Kaltenborn and the labor leaders George Meany and Walter P. Reuther. Gulick was recruited for his mastery of public administration. Born in Japan in 1892 to a prominent missionary family, he had trained alongside Robert Moses at the New York Bureau of Municipal Research, a Progressive Era reform group that had pioneered municipal budgets, performance audits and accountable government. He had worked on the Brownlow Committee, which streamlined the federal bureaucracy for Roosevelt, and he had unsnarled production and refugee crises in World War II. 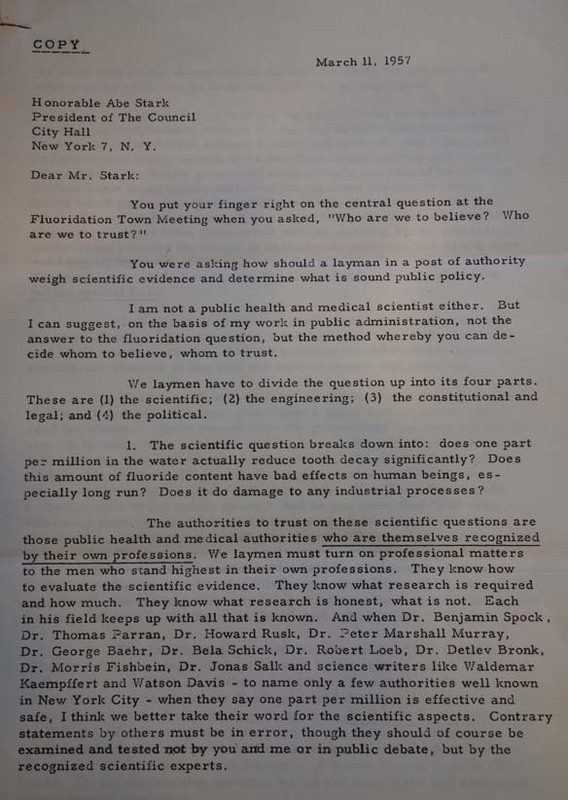 To prepare for a marathon hearing on March 6, 1957, before the city’s Board of Estimate, Gulick and his associates got 375 scientists to assemble evidence on fluoride’s safety and compiled a list of friendly witnesses, including a mother from each of the five boroughs, as well as Harold C. Hodge, a professor of pharmacology at the University of Rochester and an early booster of fluoridation. 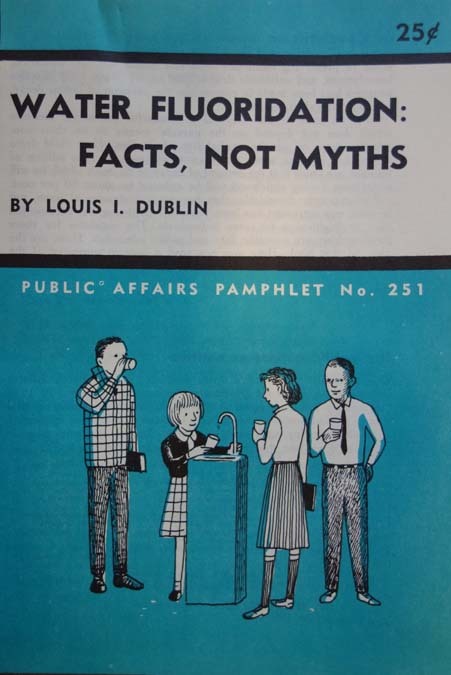 Opponents of fluoridation later accused Dr. Hodge of not disclosing controversial experiments on fluoride toxicity conducted during the Manhattan Project; supporters said the small amounts used in drinking water were proven safe. Gulick focused on Wagner, plying him with draft statements supporting fluoridation and a legal memo arguing that the City Charter prohibited the referendum that opponents were demanding and that supporters feared would play to public fears. Monroe Goldwater, a powerful Democrat and a leader of Jewish relief efforts during World War II, lobbied Wagner along with soon-to-be Republican Gov. Nelson A. Rockefeller. Gulick preferred to act alone. “I can do my part with the mayor more effectively at some other time and individually,” he wrote to Henry H. Urrows of the Committee to Protect Our Children’s Teeth. For the next six years, nothing happened. On Nov. 18, 1963, the City Council and the Board of Estimate held another public hearing. Again, hundreds thronged City Hall to testify, cheer and boo. Then, at last, fluoridation was set. But in October 1964, Wagner’s water commissioner delivered bad news: It was hard to get the chemicals. It took a year before the fluoride and feeder devices were ready. Finally, in October 1965, fluoridated water began flowing through the city’s taps. By then the city was ready to elect a new mayor, John V. Lindsay. A version of this article appears in print on February 24, 2015, on page D2 of the New York edition.